Enjoy the incomparable comfort of a European White Goose Down pillow. Regardless of what level of support you like, the Vancouver Density pillow offers the perfect density for your sleep needs. Soft, Medium and Firm support. 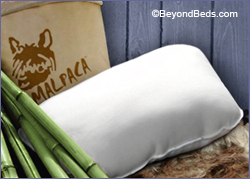 Chemical free alpaca filled pillows, covered in luxurious silky soft pure bamboo fabric. Great for severe allergy sufferers who may be sensitive to other natural fibers such as sheep's wool or feathers. Available in three fill weights, light, medium or full. 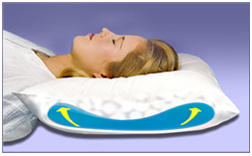 Our Side Sleeping Pillow is the most advanced side sleeping pillow available. Developed to help reduce head, neck and jaw tension, this patented Side Sleeping Pillow comes standard with a machine washable, hypoallergenic, rayon from bamboo cover. The 12-degree shoulder cradle accommodates the acute angle between your head, neck, and shoulder. Leg shaped slips on like a sock. Stays in place and moves with you as you turn. Reduces pressure by supporting your entire leg. Outer Cover - Removable, stretch cotton lycra. Pillow Insert Outer Cover - 100% Cotton. 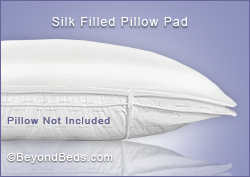 Pillow Insert Fill - High loft polyester fiber. Free Storage / Travel Bag. 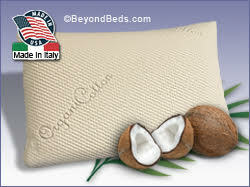 This Organic latex pillow features a 100% Natural latex core, covered with a soft quilted layer of organic Natura Grow Wool™. Naturally antimicrobial, hypoallergenic and breathable, this organic latex pillow has not been treated with chemicals and is ideal for people prone to asthma, allergies or other environmental sensitivities. Naturally Breathable and Hypoallergenic. 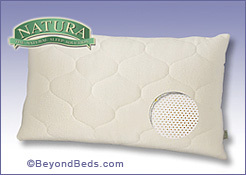 Naturlatex™ Ultimate pillows feature a solid Talalay latex core. Naturlatex™ pillows provide resilient, cradling support instantly adjusting to the unique contours of your head and neck. Our all Latex contour pillow provides superior support and comfort in varied sleeping positions, The Royal-Pedic Contour Pillow features a 99.99% natural solid Dunlop latex core. Covered with a 100% cotton removable zippered cover. Cervical dual lobe design allows for proper support without propping your head up too high. 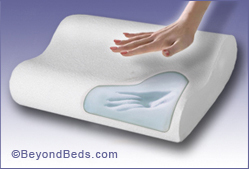 Dual-Sided- Solid Latex and Memory Foam. The Plushious Pillow delivers twice the versatility of a conventional pillow because it has two distinctive sides. There’s a memory foam side that evenly distributes weight and alleviates pressure, and a Talalay latex side that provides springy support. Latex is hypoallergenic, antimicrobial and dust-mite resistant, highly recommended for those with allergies. The Aloe Dream Mate™ features a long-lasting granulated Talalay latex core that has a down-like feel and adjusts to the unique contour of your head and neck. 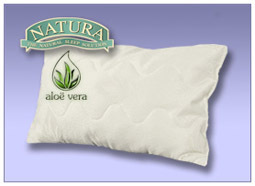 Aloe Dream Mate Pillows™ have a non removable soft cotton cover, enriched with Aloe Vera. It’s like having two great pillows in one! 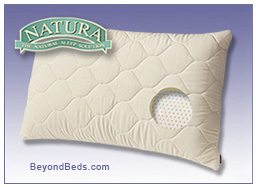 The Lavender Latex Pillow by Natura has two distinctive sides: one with granulated latex, for a comfy, cradling feather-down feel; and solid latex on the other side that provides extra support for shoulder and neck muscles. Either way, it helps you get a great night’s sleep – enhanced even further by the pleasant, relaxing fragrance of real lavender! Experience pure indulgence with these luxurious silk filled pillows, covered in white19 momme charmeuse silk, and filled with layers and layers of Grade "A" 100% pure hand pulled mulberry silk. High loft silk fill 5.5"
Transform any pillow into a luxurious silk topped pillow with this unique pure silk filled pillow pad, filled with "100% "Grade A double strand Mulberry Silk" covered in pure silk charmeuse fabric. 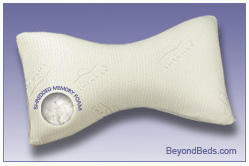 This Memory Foam Contour Pillow is manufactured using plant-based renewable raw materials, replacing portions of the petroleum-based polyols used in manufacturing most other memory foam pillows. Aerus Natural™ memory foam is an open-cell highly breathable foam with 8x's greater air flow than traditional memory foam. “Fluffable” Butterfly design with Micro-Cushion Technology ensures maximum relief from neck, shoulder, muscle and stress related pain. Thousands of pressure-relieving Visco memory foam micro-cushions move and act independently to form the first and only “Fluffable” butterfly shaped memory foam pillow. 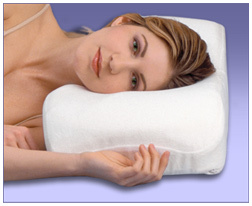 This therapeutic cervical pillow features a fillable water bladder. A thermal insulator fully encases the water bladder preventing body heat from being drawn from the head, neck and shoulders. 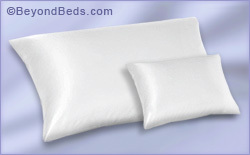 The Mediflow®pillow has a top fill of DuPont polyester fiber. Easy to follow instructions tells you how much water to add for soft, medium and firm support. Use ordinary tap water.